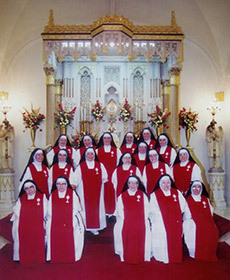 The Sisters' day is made up of prayer, both common and personal, and various types of work which utilize each Sister's gift for service in love of God and neighbor. There are also recreation periods each day for outdoor exercise and enjoyment of companionship with other Sisters in addition to free time each day for personal projects such as letter writing, reading, and hobbies. Each Sister has an hour each day assigned to her to adore the Lord on behalf of all people. Nighttime adoration is also assigned so that the able-bodied Sisters can fulfill this privilege of accompanying our Lord while many sleep. People often wonder how the Sisters support themselves. Our daily sustenance is provided by the Providence of God as He works through generous people who share their time, talents, and goods with us and through our own labor. Our benefactors receive abundant blessings from the Lord for their generosity to His spouses. Each monastic community finds its own means of support which responds to the needs in the community where they live.